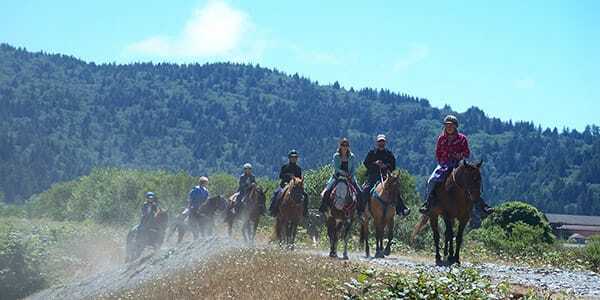 Experience the beauty of the ancient old growth redwoods on horseback! We offer daily tours. Call now to book! Join the Buckarettes for a quick trip up the mountain to get your picture taken inside one of the world’s giant wonders. Don’t forget your camera! Interpretive tour includes information on Redwoods—the world’s tallest trees—as well as wildlife, flora and local history. 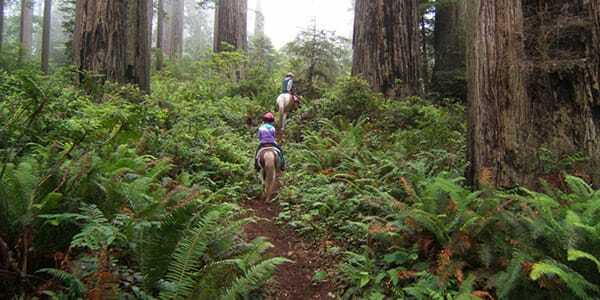 Saddle up for this 2 hour ride that takes you through the majestic old growth forest of Redwood National Park. You’ll travel up the mountain from sea level to 1100 feet, through breathtaking views of flora and fauna you’ll get your picture taken inside one of the world’s giant wonders along the way. Don’t forget your camera! Interpretive tour includes information on redwoods, the world’s tallest trees as well as wildlife, flora and local history. 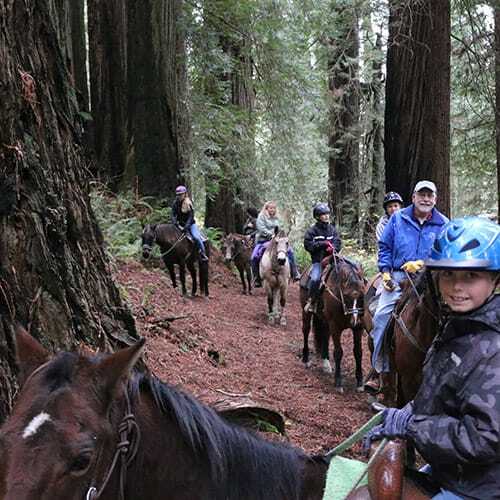 Saddle up for our 4 hour scenic ride that will take you through various stages of the Redwood forest. Along the way you will get your picture taken inside one of the world’s giant wonders. At the halfway point we will stop for a picnic lunch before heading back down the trail. 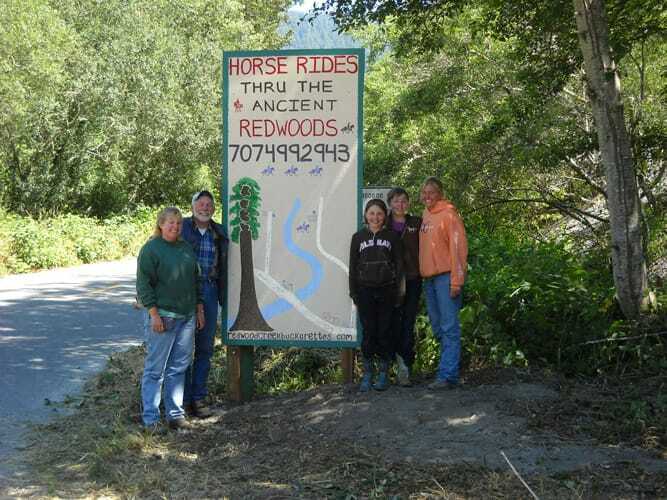 Interpretive tour includes information on redwoods, the world’s tallest trees as well as wildlife, flora and local history. No riders under age 6. No riders over 240 lbs. No riders under the influence of drugs, alcohol or marijuana. No dogs allowed on National Park trail. Helmets required for riders aged 17 and under. No open toed shoes, flip flops or sandals. Long pants and a coat or sweatshirt are recommended. 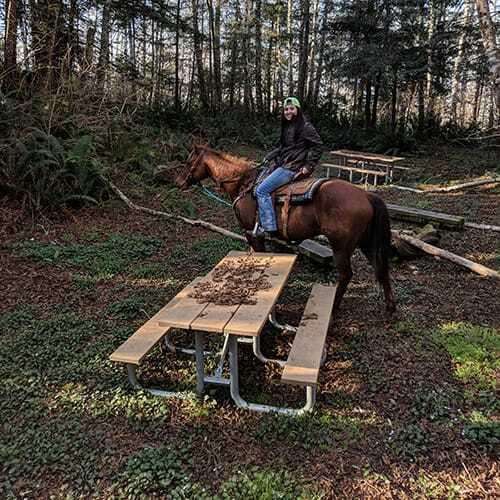 Horseback tours are not taken in the rain due to the terrain. Tours cancelled due to weather are fully refundable. Where do tours start and when? Tours start at 1000 Drydens Rd, Orick CA. See a map and get directions here. Tours leave at 10am and 2pm. Check in a minimum of 15 minutes prior to start of tour. Reservations can be cancelled 24 hours in advance for a full refund. Walking only on the trails. 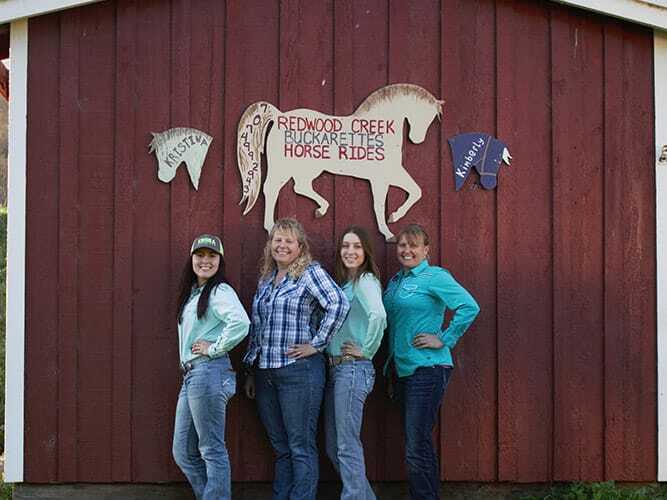 Redwood Creek Buckarettes is a family owned and operated business whose goal is to provide you with a relaxing, memorable horseback ride through the Redwood Forest. 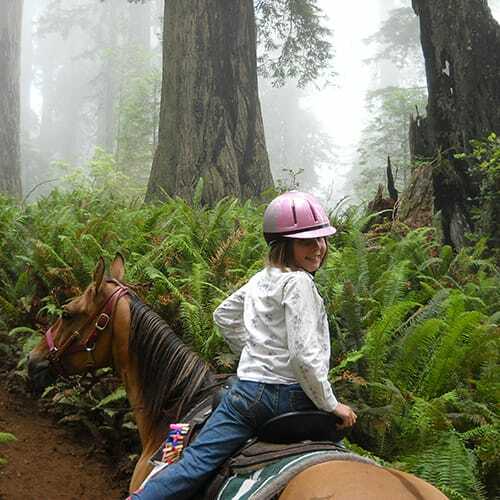 Sisters Kimberly and Kristina partnered up to offer memorable horseback tours for those coming to visit the majestic, towering Redwoods of Redwood National Park. They started giving tours many years ago, in the mid 90’s, with the former concessionaire, Tall Trees Outfitters. Junior Buckarettes Kaitlyn and Taylor—Buckarettes in training—can always be found nearby during the summer months. The family roots run deep in the Orick valley for the Buckarettes. Our family history can be traced back to before civilization as our great, great grandmother was a Native American from a nearby village. The Junior Buckarettes are 6th generation residents to the Orick Valley. 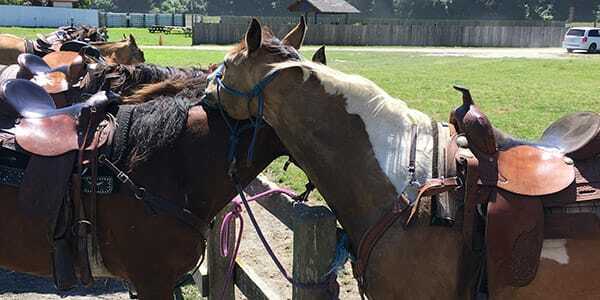 The Buckarettes have had horses in their lives since they could walk. Early memories include riding with Dad on Thanksgiving day! Junior Buckarettes have been riding all of their life and received their first pony at age 4. 300 miles south of Portland, Orick is located on Hwy 101, 2hrs from the Oregon/CA border and 1hr south of Crescent City. After arriving in Orick, cross over Redwood Creek Bridge and turn left at the Orick School onto Drydens Road. Follow the two lane country road approx 1 mile to the Orick Rodeo grounds and Buckarette Headquarters. 300 miles North of San Francisco, Orick is located on HWY 101, 4hrs North of Ukiah and 1hr North of Eureka. Once arriving in Orick, turn right onto Drydens Rd just before the Orick School. Follow the two lane country road approx 1mile to the Orick Rodeo Grounds and Buckarette headquarters. 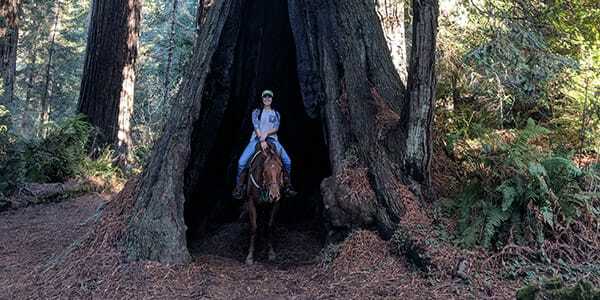 If you're planning a vacation in the Redwood National Park, here are some links to other fun places near us.